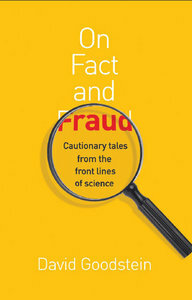 David Goodstein, "On Fact and Fraud: Cautionary Tales from the Front Lines of Science"
Fraud in science is not as easy to identify as one might think. When accusations of scientific misconduct occur, truth can often be elusive, and the cause of a scientist's ethical misstep isn't always clear. On Fact and Fraud looks at actual cases in which fraud was committed or alleged, explaining what constitutes scientific misconduct and what doesn't, and providing readers with the ethical foundations needed to discern and avoid fraud wherever it may arise. In David Goodstein's varied experience–as a physicist and educator, and as vice provost at Caltech, a job in which he was responsible for investigating all allegations of scientific misconduct–a deceptively simple question has come up time and again: what constitutes fraud in science? Here, Goodstein takes us on a tour of real controversies from the front lines of science and helps readers determine for themselves whether or not fraud occurred. Cases include, among others, those of Robert A. Millikan, whose historic measurement of the electron's charge has been maligned by accusations of fraud; Martin Fleischmann and Stanley Pons and their "discovery" of cold fusion; Victor Ninov and the supposed discovery of element 118; Jan Hendrik Schön from Bell Labs and his work in semiconductors; and J. Georg Bednorz and Karl Müller's discovery of high-temperature superconductivity, a seemingly impossible accomplishment that turned out to be real.